What do you do with all that “old stuff” laying around your home? You can leave it where it is, throw it out, or sell it to make a few dollars. Out of these options, there is one that is head and shoulders above the rest. You guessed it: selling these items for cash is clearly the way to go. This gives you the chance to cut through the clutter while making a few extra dollars along the way. Reselling items through traditional outlets like Craigslist and eBay can make sense. However, you’ll need to think out of the box to sell some of the more obscure items around your home. There are many items you can “recycle” as a means to earn money, help others, and do good for the environment. Let’s start with one of the most obvious choices: soda cans. Are you the type of person who drinks several cases of soda every month? If so, find a recycling program in your town that pays for empty cans. You may only earn five cents per can, but over time this can really add up. What about ink cartridges? These programs are picking up a lot of steam. Although you may go through an ink cartridge every so often at home, the real money can be made when you coordinate with local businesses. For example, is your employer currently recycling ink cartridges? If not, ask for permission to collect these instead of throwing them in the trash. 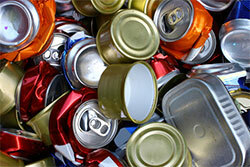 As long as you are honest about why you are collecting them – to recycle – your employer likely won’t have an issue. Many big name companies, such as Staples, have ink cartridge recycling programs. At this time, Staples is offering $2 back in Staples Rewards for each cartridge. With a maximum of 10 per month, this works out to $20 in savings. Surely, you can use this $20 at your local Staples for something – even if it’s just for the candy next to the checkout counter. Do you live close to a golf course or driving range? Every day, errant shots make their way out of play. From there, the golfer grabs another ball and never again thinks about the one that was lost. Fortunately, this is a great way for you to cash in. There are companies, online and off, that buy used golf balls. The more you collect, the more money you are going to earn in return. Plus, picking up these stray balls is good for the environment. How much can you earn? This depends on multiple factors including the condition, the buyer, and how many balls you are selling. Generally speaking, you will be able to make between five and fifteen cents per ball. Tip: To get a better deal, sell the balls direct to driving ranges or end consumers. Whether you have these items around your home or need to go out and collect them on your own, you can earn a nice side income from reselling and recycling what you might otherwise think of as trash – or at least you’ll be able to fund your soda habit. Don’t throw your old stuff in the trash. Instead, recycle it for cash!